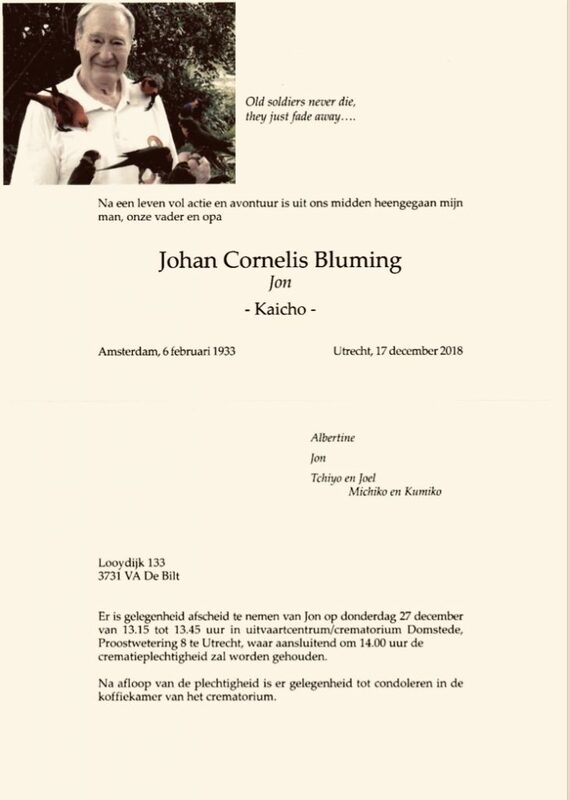 maandag 17 december 2018: IBK Kaicho Jon Bluming overleden te Utrecht (Nederland) | RONIN M.M.A. It is with the greatest of sadness that we have to inform you of the death of our founder and Budo father Kaicho Jon Bluming. Kaicho, you were a man who would instilled a fierce loyalty and love in your friends and students. You were a true martial artist and the last of the great legends. Kaicho, it says much that your loss will truly be felt around the world. You were a martial arts innovator, a formidable fighter and retained an incredible sense of humour. Kaicho, our Kaicho, we will not forget you, we will remember you in our hearts, in our training and in your Budo philosophy. Our hearts are broken, but we will rise again, because that is what you taught us. Rest now Kaicho, we will continue your legacy. We will not fail you. Osu! Important notice regarding the funeral of Kaicho Jon Bluming. To all IBK members worldwide, the funeral of our founder and Budo father will take place Thursday 27 December 2018 at 14:00. The venue will be Domstede Dela, Proostwetering 8, 3543 AE. Utrecht, The Netherlands (+3188-3352130).